Which limbs the frog uses most to land depends on where and how he's landing. If the frog jumps along a level surface, his back legs do the work and the front legs support him. If the frog jumps upwards or downwards, he can use the front limbs to catch himself and the back legs follow. The frog's back legs are what do most of the work during jumping and landing. 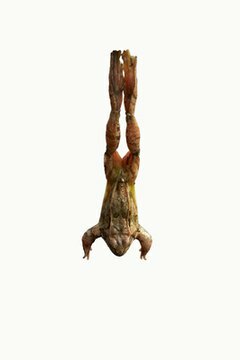 To jump, the frog contracts his extensor thigh muscles and his feet push off the ground, projecting him into the air. When the frog lands, his feet take the majority of his weight, his back legs bend, his front half lowers and his front legs catch him, holding up his weight. A frog's front legs are his shock absorbers when he lands a jump. While the back legs do the work of springing and touching down, the front legs are there for support. Without the front legs to help catch him, the frog would land flat on his belly. In 2010 Dr. Richard Essner of Southern Illinois University Edwardsville and his colleagues actually studied primitive frog species that perform a "belly flop" on each landing. Instead of using their front limbs to catch their weight, the frogs splay out and their bellies land flat on the ground. The frogs then take longer to recover from each jump. These primitive frogs are a clue from the past showing us how frogs evolved to become more efficient leapers and landers. Aquatic and semi-aquatic frogs live most of their lives in the water or near it. Swimming is an essential skill and leaping is mostly done on level surfaces or for dives. Because the frog's habitat relies on these kinds of movement, the back legs have developed to be much larger than the front legs. Water-loving frogs have muscular back legs with large feet so they can perform big jumps and swim quickly. Their front limbs are small because they're not as important to the frog's primary forms of locomotion. Some frogs live in environments where the front legs are just as important as the back legs and are about equal in size. Tree frogs use their front legs heavily. If you watch a tree frog leaping through branches, you can see him reach out to his target with his front legs and feet to take hold of a surface, then draw his back legs onto it. In the case of tree frogs the front and back legs split the work of locomotion almost equally. How Is a Frog's Tongue Attached Differently Than a Human's? Where Is the Frog on a Horse's Hoof?